Windows 10 is optimized towards tablets along with the availability of a fully functional desktop. A small but important change everyone noticed is 'one touch delete' of any file. All the previous versions of Windows were used to confirm the delete action by 'Delete confirmation dialog'. But in the case of Windows 10, when user press deletes key, the file gets deleted without asking for the confirmation. It may be useful for some users but most of the traditional users do not like it. Here is a simple two-step way to re-enable delete confirmation message. Go to the desktop and right click on Recycle Bin icon. 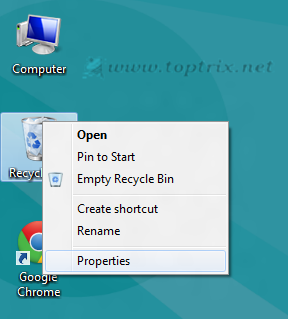 A Recycle bin properties window will pop up. Tick the option, "Display delete confirmation dialog"
Now deleting any file will ask for confirmation.